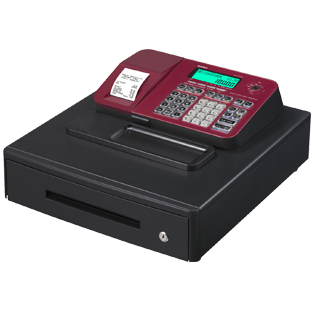 Casio SE-S100-RD Red 'as new' catalogue return cash register. These cash registers are all as new, customer returned without even using them! All original packaging, machines unused. Supplied with manuals and keys, but no spool (if you need a spool you can add 1 from the drop down below, but if you are issuing receipts with every sale then you don't need the spool). Supplied in original boxes, but may have bubble wrap instead of the original packaging. Please note that we cannot accept returns on any products in our catalogue returns section including this one. Order a brand new Casio SE-S100 here.